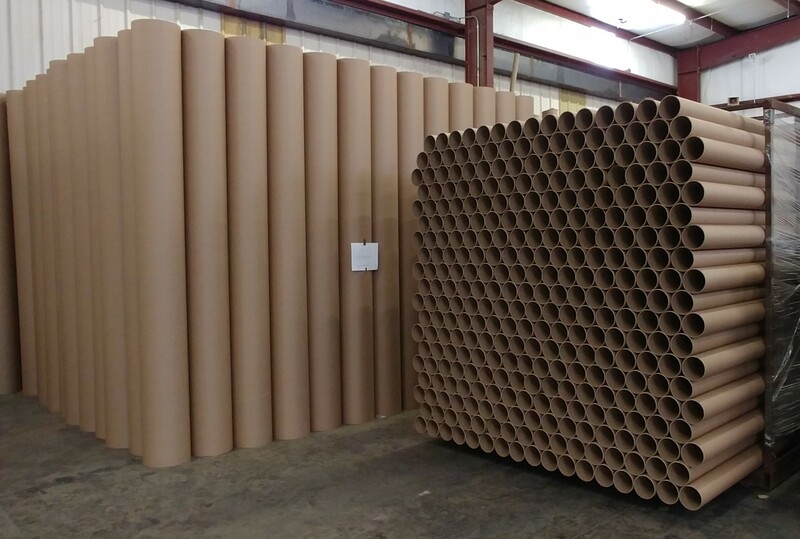 How It Works: Paper Core Production | Anderson Forest Products, Inc.
Have you ever wondered how a paper tube is made? Have you ever wondered how something made out of paper could be strong enough to support coiled cable? Here’s your chance to learn everything you never knew about paper cores. Paper cores are long tubes used for many applications that range from paper towel rolls to cable reels, and many things in between. They are also called paper tubes, spiral-wound paper cores, and fiberboard cores. The first step in the production process is to set up our raw materials to feed into the machine: special paper and glue. The paper we use comes in rolls of 1,000 square feet and is typically 4 inches wide. The number of plies (layers) we use determines the thickness of the paper core’s wall. We have to be sure to set it up at the correct angle to create a seamless spiral as it goes through the machine. As for the glue, we purchase crates of it by the truck load since we go through it so quickly. Second, the strips of paper run through a pan of glue, which makes the plies stay together and keeps the final product from falling apart or collapsing. Third, the glued strips come together as they wind around a metal bar, called a mandrel. The size of the mandrel determines the inner diameter of the paper core. A strap forces the paper to rotate, and the angle of the paper as it feeds in creates the spiral as it rotates. The heat from friction causes the glue to dry and harden within seconds. Finally, the continuous spiral-wound paper core is cut to size as it comes off the mandrel. The blade moves at the same speed as the core to ensure a straight-edged cut. We can create any custom diameter that you require. Our most commonly produced diameter sizes are: 3.04”, 3.125”, 3.75”, 4.25”, 4.76”, 5.00”, 5.75”, 6.04”, 7.70”, 9.55”, 10.04”, and 11.55”. The wall thicknesses of our paper cores can range anywhere from 1/10” to 5/8”. 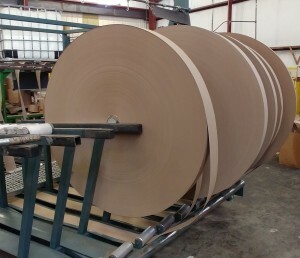 We use our paper cores in the plywood reels and plastic reels we produce. Making paper cores in-house instead of outsourcing and helps us keep our reel prices low. We also sell our fiberboard cores to other reel manufacturers and customers who assemble their own knocked-down reels. 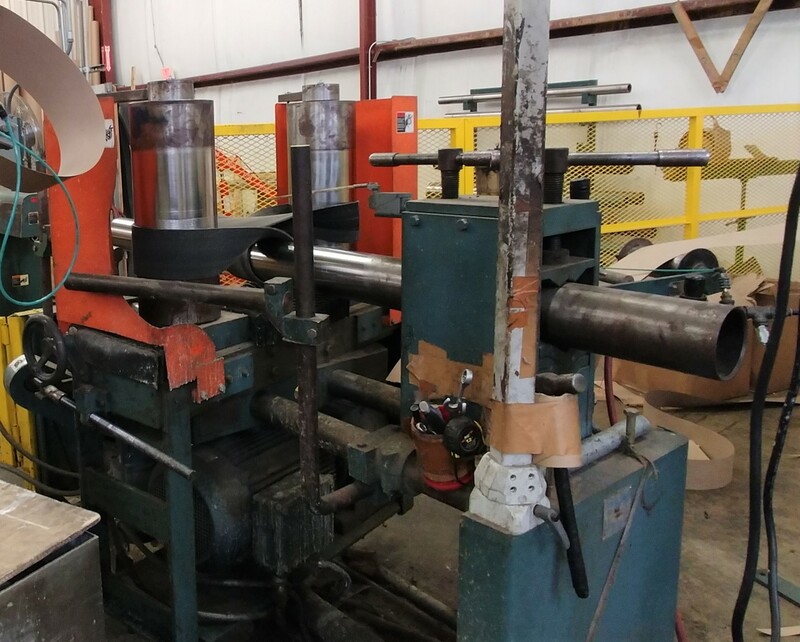 To request a quote for spiral-wound paper cores and/or reels, visit this site or give us a call at (270) 487-6778.